Cheese Macaroni is a popular Italian recipe. A quick filling, one-pot family dinner that everyone will love. Learn how to do it by following this easy recipe. Prepare this healthy delicious Orange Strawberry Smoothie in a hot day and refresh yourself just in a single gulp. We are so grateful and excited to guest host our next blog event. We would like to thank Chef Mireille for this great opportunity. 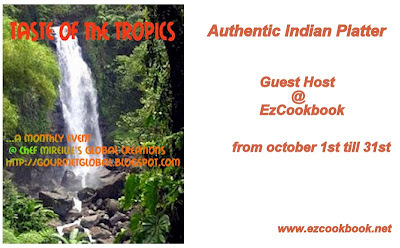 For the month of October, We are guest hosting Chef Mireille’s Taste of the Tropics event with the theme of Authentic Indian Platter. Semiya Payasam is one of the the most famous Indian sweet delight . In india any celebration is impossible without payasam. This enticing vermicelli pudding is really super easy and super delicious one among many Payasam recipes. Vermicelli is roasted in ghee and cooked with milk. This creamy pudding is then sweetend and garnished with cashew nut, raisins. A mexican style simple yet delicious breakfast Quesadillas. Weekend mornings are very special to me, a chance to wake up late and take time to make some special breakfast. This is most favourite breakfast for my daughter(lover of cheese). These are special - they are quesadillas and they doesn't required much attention to cook . You simply need to scramble egg, grate some cheese and top on quesadillas and cook until cheese melts. Serve with salad and yogurt. Potato Manchurian is a very tasty and tangy Indian Chinese starter. A perfect dish for kids. Can be served as a starter in party or kids Tiffin or as a evening snack. If Kids favorite, Tummy Happy Mummy Happy!!!! A very refreshing Lemonade made with cucumber and lemon. This one be really big hit with all cucumber lover's and especially during peak summer. The minerals in the cucumbers are a welcome relief for sizzling bloodstream. Cool as a cucumber and shine like a Lemon. Intake a large glass of lemon water every morning, it balances pH, helps to keep skin clear and glow, it kick start your digestive tract and helps in weight loss management to shape up the body. Lemon is a natural energizer and it hydrates the body to feel refreshed. Today we would like to present you one of the favourites of Lord Vinayagar, Chickpeas Sundal. This is an energy packed, Power packed and protein Packed Sundal which is also easy to make and offered as a Neivedhiyam for Vinayagar on his Birthday. Prepare this sundal as a evening snacks to have after school. Vinakayar Chaturthi celebration at my mom's place with lots of god's favorite prasadam. Wishing you happiness as big as Ganesh’s appetite; life is long as his trunk; trouble as small as his mouse; and moments as sweet as his laddus. Best wishes on Ganesh Chaturthi!!!! Ganesh Chaturthi is incomplete without Lord's Favourite Ladoos. Every year we serve him with our traditional Gujarati Ladoos called Churma Na Ladoo. Gujaratis and brahmin community in particular are very fond of these Ladoos. They made from wheat flour and ghee and it gets its sweetness from jaggery. 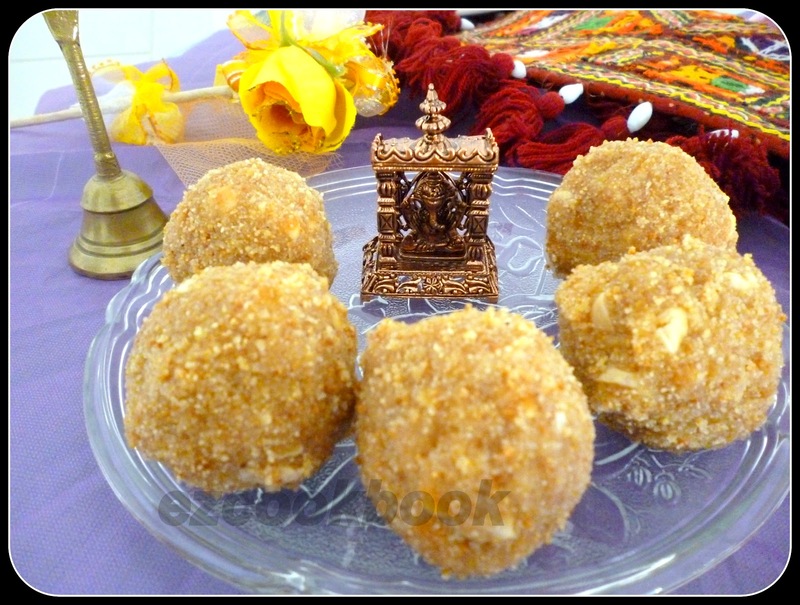 Guajarati Brahmin's feast is incomplete without Churma Na Ladoo during festivals and weddings. Follow the recipe here and learn how to make Churma Ladoo. Kudumulu also referred as Undrallu(steamed rice dumpling). Its a famous delicacy from AndhraPradesh (southern part of India). This is a healthy breakfast recipe. It is prepared especially during Vinayaka Chavithi / Vinayakar Chaturthi. Lord Ganesha is said to be fond of Undrallu or Kudumulu. So it is prepared and served as Prasadam / Naivedhyam to him on that day. An excellent steam cooked food with very mild flavor and taste which goes well with any spicy chutney or pickle. This Kudumulu is a savory version rice balls with combination of rice and chena dal. Very simple and delicious recipe that can be made faster with good source of carbohydrate and protein. A Perfect food for kids. Mysore paks are a treat for any festival. My mom makes it for any occasion at home and I have wondered how she makes such mouth melting Mysore paks. I wanted to try it and the first time I tried it the taste was so good and real, but I got a semi solid sweet that didn't resemble the real mysore Pak in appearance. So I went back to my mother and observed how she made it and it clicked the next time. As the saying Practice makes everything Perfect, this time I got a nice textured and tasteful Mysore Paks. You can also try this following the recipe given. We are commencing our first event Let's Party - Prasadam / Prasad Special with the most favorite recipe/ prasadam for the Lord Modaka Priyar (Lord Ganesha) - Modakam . Vegetable Manchurian is an easy to make Indian Chinese recipe. It can be served as starter if Deep fried vegetable balls tossed in soy and chilli sauce. Or it can be served as gravy if dipped into thick sauce/gravy made from soy and chilli sauce. Enjoy the delicious recipe of Veg Manchurian Dry here. Karela or Bitter gourd is very well known for its bitterness in its taste and hence people usually keep away from this vegetable. But Bitter gourds are very low in calories but dense with precious nutrients. It is an excellent source of vitamins B1, B2, and B3, C, magnesium, folic acid, zinc, phosphorus, manganese, and has high dietary fiber. It is rich in iron, contains twice the beta-carotene of broccoli, twice the calcium of spinach, and twice the potassium of a banana. When it is cooked with Besan / Gram flour the dish will give us double nutrients. Follow this recipe Karela/Bitter Gourd Tossed in Besan and believe me you will not feel any bitterness in this subji and will surely like its taste. Do you want to make an easy to make snack for your kid that is nutritious as well? Make this moong dhall balls or pasi paruppu urundai which will be more healthy with proteins hidden inside the balls. My MIL makes it and I love it so much. The procedure for this easy to make dish is as follows and it is a must try for those who haven't tried it so far. Thank You Jaishri for sharing this healthy recipe with Us. A healthy yet tasty drumstick leaves fry which is unknown recipe among many of us. This recipe I learned from my SIL Jaishri. This is very excellent dish goes well with hot rice. Snake gourd masala is a simple south Indian dish made with so called pudhalangai(tamil)/potlakaya(telugu). Like other gourds snake gourd is also very high in water content and has cooling effect on the body. A low calorie veggie with less fat but filling and good for weight-loss diets. It has got high fiber content which helps to keep digestive tract healthy and good for diabetes too. Karunaikizhangu is known as Yam ordinary in English. This is a very good medicine for piles. This Karunaikizhangu Masial can be made to serve with Dhal and rice. Being my hubby's favourite dish, I learned this from my MIL who makes it very well. This is also easy to make and the procedure is as follows. Shojhi it is combination of rice and moong dhal recipes. The wholesome healthy steamed rice with mild spice of red chilli. This is one of the traditional recipe in our home which is usually prepared for breakfast. This is easiest and simplest one pot dish with good source of protein, carbohydrate steam cooked food. This is always been accompanied with Tenkai Ooripindi/Thengai Thogayal/coconut chutney. This chutney is traditionally we call it as Tenkai ooripindi(telugu) and in tamil as thengai thogaiyal. This is similar preparation like chutney but the only difference is will be thicker than normal chutney and as named as thogaiyal/ooripindi. This is really a delicious preparation that goes well with any Indain breakfast, off course if you find less time to cook dishes for lunch just steam cook rice serve this chutney along with it, dollop of ghee to taste awesome with appalam/chips to munch. If I dont find any vegetable at home to cook and have only eggs at home I make this muttai kuzhambu with some appalams and steamed rice. This recipe is one of the favorites of egg-terians. It is also effortless in making. 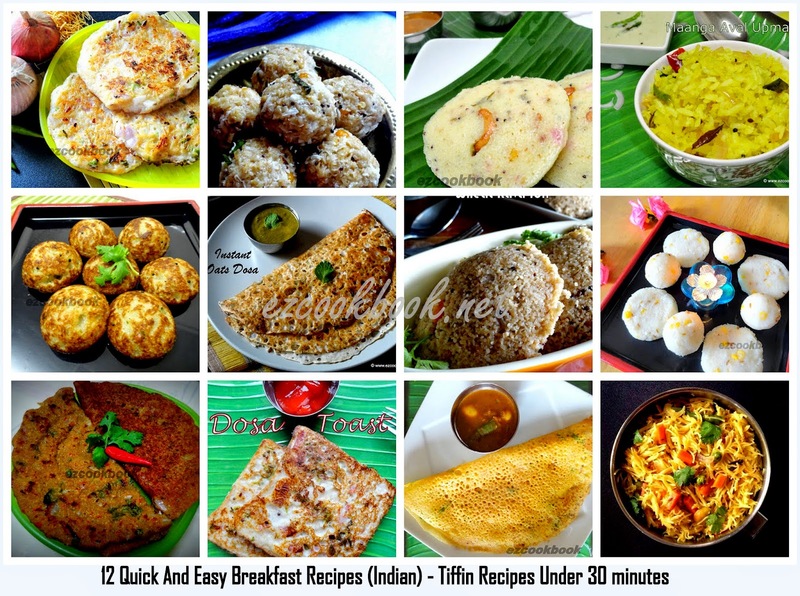 The recipe for such an easy kuzhambu is as follows. Pulishery is a delicious side dish made of curd , coconut and fruit to make Onam special. You will definitely fall in love with this Pulishery as your senses will be aroused with its sweet and sour taste. 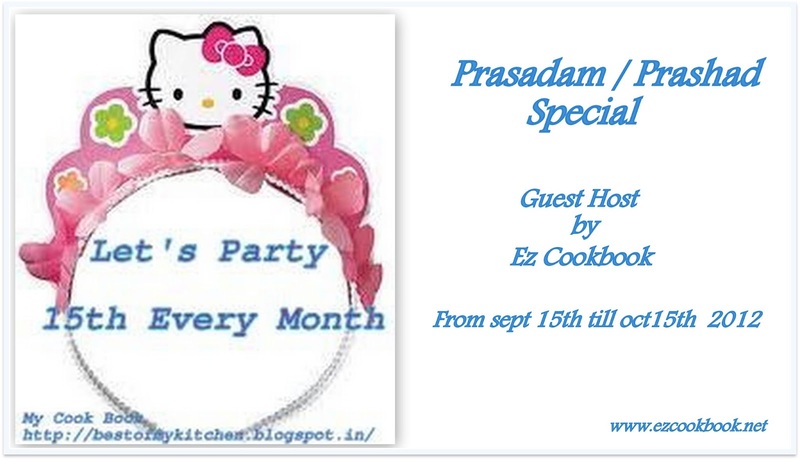 Thanks Jyothi Kathir for sharing this Onam Special Pulishery recipe with us. Here goes the recipe of Pulishery.